Every year in January, the Belle Epoque week takes place in Kandersteg. Snow-covered winter landscape, crystal-clear air - this is the world of sled dog sport. 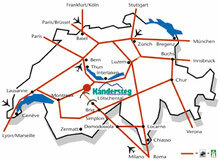 Around 140 teams meet annually in February in Kandersteg to the international Sled dog race.